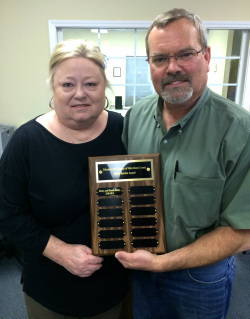 The Bailey Service award is named in honor of Johnny and Rhonda Bailey. Johnny served on the VFL Board of Directors for six years from 2008-2013. During that time he devoted countless hours to VFL projects and fundraisers. Johnny was instrumental in launching the annual VFL Duck Race which has raised over $20,000 to support literacy programs in Habersham County since its inception in 2012. Before that he spearheaded the agency's SPLASH fundraiser which also drew in thousands of dollars to help improve people's lives through literacy. Johnny Bailey chaired and sat on several committees that oversaw VFL's programs and board development and whenever help was needed he was always among the first to volunteer. Johnny's energy, enthusiasm and servant's heart proved invaluable to promoting and advancing the cause of literacy in Habersham County. Rhonda Bailey served alongside her husband volunteering her time and talents to help VFL meet its mission and goals. From helping with numerous fundraisers and events to managing the agency's books, Rhonda Bailey served - and continues to serve - the people of Habersham County through her involvement and dedication to VFL. The Bailey Service Award is presented annually to a Volunteers for Literacy of Habersham County board member and/or community volunteer who exhibits the highest ideals of community service. The recipient of this award has helped Volunteers for Literacy fulfill its mission by dedicating their time, energy, talents and resources to promoting and advancing the cause of literacy in Habersham County.